Does your Dog deserve a special reward? Not sure what to offer anymore? Well... Here's a unique, cool pet treat! "Throw a pass to your wide-open receiver, watch the tasty goodness disappear"! This COLLEGE Dog Snack 7oz team treats are designed just for you! These DOG COOKIES are in a shape of a FOOTBALL! Each PET COOKIE has the Team Logo Engraved! WOW!!! Made with the finest natural ingredients like rice flour, chicken, and fish. They will help maintain healthy teeth and gum for your 4-legged sport fan. Each COOKIE TREAT has the Team logo engraved to make this a Special Dog Treat for when it's time to reward your dog! No Soy, Wheat, Artificial Flavors, Colors, or Preservatives. Made with the Finest Natural Ingredients. Textured treat helps to stimulate gums for oral health. Officially Licensed by the COLLEGE & the Team! Alabama Crimson Tide, Arkansas Razorbacks, Arizona State Sun Devils, Arizona Wildcats, Auburn Tigers, Boston Eagles, California Golden Bears, Clemson Tigers, Connecticut Huskies, Florida Gators, Florida State Seminoles, Georgia Bulldogs, Iowa Hawkeyes, Illinois Fighting Illini, Indiana Hoosiers, Iowa State Cyclones, Kansas State Wildcats, Kansas Jayhawks, Kentucky Wildcats, LSU Tigers, Maryland Terrapins, Michigan Wolverines, Miami Hurricanes, Mississippi Rebels, Missouri Tigers, Michigan State Spartans, Mississippi State Bulldogs , North Carolina State Wolfpack, Nebraska Cornhuskers, Ohio State Buckeyes, Oklahoma Sooners, Oklahoma State Cowboys, Oregon Ducks, Oregon State Beavers, Penn State Nittany Lions, Pittsburgh Panthers, Purdue Boilermakers, South Carolina Gamecocks, Syracuse Orange, Texas A and M Aggies, Tennessee Volunteers, Texas Longhorns, USC Trojans, Utah Utes, Virginia Cavaliers, Virginia Tech Hokies, Wisconsin Badgers, and West Virginia University WVU Mountaineers. Choose your favorite Football Team & enjoy this new special treat made by Pets First! Click Add to Cart now & show your love for your dog & your favorite SPORTS TEAM!!! NCAA DOG SNACK: Reward your pet while you reward your COLLEGIATE team! - INCLUDES: 7 oz (0.5lb) of Football pet cookies designed for your sporty pup! Made in the USA! - These cookies are made by long established USA dog industries! BEST DOG REWARD: Is your puppy in training & needs rewards? Whether your dog is being trained to go on the TRAINING PADS, or its time to give your dog positive reinforcement, these PUPPY TREATS are the ultimate dog reward! ENGRAVED LOGO: - Each dog food treat has your favorite COLLEGE team logo engraved! Wow! Are you a SPORTS FAN??? Now you can show it too! 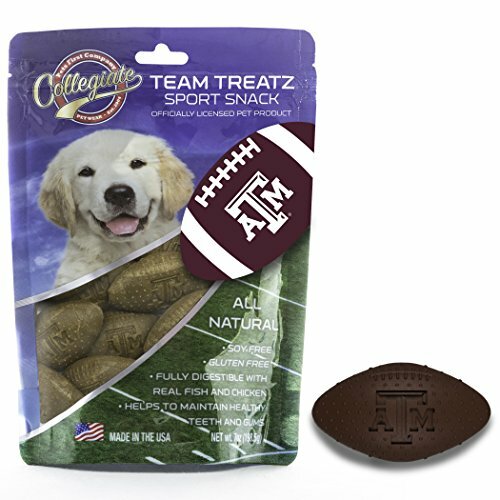 LICENSED: The only Football shaped dog cookies with the Team LOGO engraved, officially licensed by the NCAA! - Don't be fooled by other companies selling counterfeit, unlicensed, low quality products!